Banana Ice Cream with a Rum Caramel Swirl. 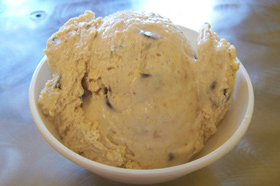 Cannoli Cream Ice Cream with Chocolate Chips and Crushed Cannoli Shells. Topped with Pistachios. Dark Chocolate Ice Cream, Chocolate Chips, Brownies, and Fudge. Peanut Butter Ice cream, Reese’s® Peanut Butter Cups and Fudge. Sweet Cream Ice Cream, Graham Cracker Pie Crust, Toasted Marshmallow Cream and Fudge. Vanilla Bean Ice Cream, Strawberries, Carmel, and Waffle Cone Pieces. Tiramisu Ice Cream, Chocolate Chips, and Lady Fingers.